What are the values and beliefs of Aboriginal and Torres Strait Islander people? All cultures and societies have particular values and beliefs, which enable a sense of identity and meaning. Aboriginal and Torres Strait Islander people’s values and beliefs are based on an understanding of the world that integrates the spiritual with the material and emphasizes the individual’s relationship to community. There are many cultural differences amongst Aboriginal communities, as well as Torres Strait Islander communities. There is in particular substantial diversity between mainland Aboriginal people and the Torres Strait Islander people. They are separate people in origin, history and way of life, even if some common points can be found. The parenting role places great importance on letting the child know who they are in relation to their family, their kin, their people, their environment and the living spirits of their ancestors and land. These relationships help to define a child’s identity by defining how they are connected to everything in life. Aboriginal people have a deep spiritual connection with the land. For an Aboriginal child, relationships are not only with people but also with their environment: the land, the animals, the plants, the skies, the waters, the weather and the spirits. Each clan or language group lives in well-defined areas that it owns according to its own ancestral law. Religion and land are the key determinants of Aboriginal culture, traditions, customs and beliefs.For Aboriginal and Torres Strait Islander people, land, sea and spirituality are the foundations on which their culture has been built. The Aboriginal Dreamtime is the part of Aboriginal culture that explains the origins of the land and its people. It is Aboriginal religion and culture. The Dreamtime contains many parts: it’s the stories of things that have happened, how the universe came to be, how humans were created, and how the creator expected humans to function within the cosmos.The many Aboriginal groups have different Dreamtime stories, but all stories teach aspects that impact on daily life. These stories are passed on to young children through storytelling, art, music and ceremonies. Through Dreamtime stories, children’s learning is staged. When children are able to fully understand the meanings behind the Dreamtime stories then the story’s relationship with life experiences are explained. Dreamtime stories teach Aboriginal people the importance of sharing and caring for people of their own community, of nurturing the environment and the significance of the land and creatures therein. Dreamtime stories pass on stories of the history of Aboriginal people and their relationship with the environment and of their connection with their spirituality. The Dreamtime should be treated with the same respect that is given to other religions, beliefs and values. Aboriginal people have a complex system of family relations. Extended family relationships are at the heart of the Aboriginal kinship system and are central to everyday life, how culture is passed on and how society is organized. The kinship system determines people’s roles, how they relate with others, their responsibilities and obligations in relation to one another and to ceremonial business and to the land. Kinship systems and organizations vary across the diverse Aboriginal groups within Australia. It is often Elders or grandparents that hold extensive knowledge of the kinship system and the laws and rules that govern it. A Skin group is the subdivision of societies/communities into named categories. There are a number of skin groups within language groups. Traditional Aboriginal people are born with a skin name. Skin groups govern social behaviour, interactions and relationships. They determine who individuals can and cannot speak with, marry and trade with, they also determine natural enemies. In addition to Skin groups, traditional Aboriginal people belong to moieties. All things – spirit beings, plants, animals, clan groups, belong to a moiety. If you would like to learn further information about how moieties are established for traditional Aboriginal people, it is a good idea to seek specific information about a child from their respective family and/or community. A clan usually consists of two or more family groups that share an area of land over which they have ownership. Clan boundaries are passed from one generation to the next, generally through the father. Totems are non-human species or phenomenon that stand for or represent a group of people. Totems connect people through their physical and kin relatedness. Totems are still important today in Aboriginal culture and are still used as a way of continuing and maintaining connections with the land, the Dreamtime and their ancestors. At the time of birth, or just before the birth, a child is given totem(s). Totems define people’s relationships to each other and give them particular rights and roles within the language group. Generally, the birth totem would come from the mother or father through a spiritual sign linked directly to the spirit of the ancestor that the totem represents. For example, a goanna may cross the mother’s path during her pregnancy. The child is then seen to be linked to the Goanna Dreaming or an ancestor, and as such, has a special relationship with the goanna and with the physical location where the mother saw the sign. Other totems are also given during birth ceremonies. These are dependent upon the parent’s language group, their totems or kinship ties, the marriage lores and the area in which they belong. Aboriginal people have special responsibilities to their totems and ensure their survival by protecting them in different ways. Aboriginal cultures place a great emphasis on the importance of social relationships and extended family. Individuals are seen as belonging to their family, clan and their traditional land. This is often demonstrated when Aboriginal people ask each other “ where are you from?” or “who is your mob?” when they meet. This emphasis on social connection and relationships promotes the view that each individual is important as they have a role to play within the community; it also promotes the value of mutual obligation. Aboriginal cultures consist of systems of obligations and responsibilities that bind all members of the kinship system. This sense of mutual obligation and responsibility is learned and fostered from a young age. This can be seen by children looking after one another and having responsibilities to care for younger children. Sharing is also highly valued and promoted. Sharing is seen as an obligation, it can include sharing one’s home and possessions, in particular if someone is in need. Social and caring responsibilities, such as the rearing of children, is traditionally distributed among the large kinship network. Having multiple carers within the kinship network promotes multiple enduring relationships within the community and provides multiple people looking out for the children, supporting and maintaining their emotional health, safety and development over their lifespan. It also provides valuable sources of education, passing on traditions, knowledge and affection. Aboriginal people have been described as ‘the world’s first astronomers’. Aboriginal people’s knowledge about the land, seas and skies are communicated through Dreamtime stories. Dreaming stories explain how ancestral spirits have left symbols all around to guide us in our lives. If you can understand these symbols then you have a complete understanding of the world and of the meaning of life. Dreaming stories also explain tides, eclipses, the rising and setting sun and moon and the changing positions of rising stars and planets throughout the year. Aboriginal Astronomy is a name given to Aboriginal culture which relates to astronomical objects such as the Sun, Moon, the stars, planets and the Milky way and their motions in the sky. Across Australia there are many different and rich Aboriginal cultures that each have their own astronomy, however there are many common threads. A few of these are detailed in further information through the links below. 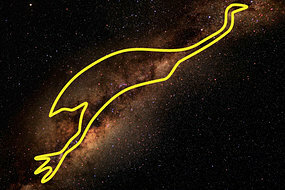 A constellation in the sky used in Aboriginal Astronomy is the Emu in the sky. This constellation is identified by its dark and opaque clouds of dust and gas that is visable against the milky way background rather than the stars. That dark clouds are called the Coalsack by astronomers, and are the birthplace of new stars. The Coalsack is the head of the emu. Stretching away to its left you should be able to see its long, dark neck, round body and finally the legs. The Emu in the Sky has featured in Aboriginal storytelling for thousands of years. Many different language groups have their own interpretation of the Emu’s heavenly fate, along with a rich and diverse range of stories about Mallee fowl, parrots, fish, stingrays, hunters, men, women, girls and boys. In many Aboriginal cultures, the Moon is seen as male and the Sun female. There are various traditional stories of the Moon and the Sun. An example of this is the story of the Yolngu people of Arnem Land, tell how Walu, the sun woman, lights a small fire each morning, which we see as the dawn and warms the land. She paints herself with red ochre, some of which spills onto the clouds, creating the sunrise. She then travels across east to west with her blazing torch creating daylight. As she descends to the western horizon she puts out her torch and starts the journey underground back to the morning camp in the east. The Yolngu people call the Moon Ngalindi. Ngalindi was once young and slim, making him the waxing Moon, but grew fat and lazy, and became the full Moon who expected others to feed him. His wives attacked him with their axes, making the waning Moon. He managed to escape by climbing a tall tree but was mortally wounded and died, causing the new Moon. After 3 days he rose from the dead and gradually regained his health, giving us the waxing Moon. After 2 weeks, when he was round and fat again, his wives attacked him, and so the cycle continues to repeat every month. Torres Strait Islander people are Melanesian in origin and part of the Pacific Islander group of kinship-based societies and are one of Australia’s Indigenous communities. Their traditional life in the pre-contact period was heavily affected by the Papuan influence in terms of trade, social organization and language.Torres Strait Islander culture places emphasis on the links between the land, the sea and traditional custom and law. In terms of spirituality, the sea is as important as the land in influencing religious practice and custom. Custom and law play a determining role in social, political and economic structures that are hierarchical in nature. The traditional law governed land tenure and justice, and maintained harmony and trade between the islands. Island chiefs are the key leaders of the community and remain so to this day, despite the influence of the missionaries, as many of the church leaders are also island chiefs.One of the most significant differences between Torres Strait Islander and Aboriginal people is in regard to child rearing practices. The diversity between the two cultures can also be explained by looking at the Dreamtime stories. How can I support the child’s values and beliefs? Aboriginal and Torres Strait Islander children in out-of-home care placements that are cut off from their (family) culture and spirituality are at great risk of psychological, health, development and educational disadvantage. They suffer as children and later as adults from the grief and loneliness of not belonging. They are also being denied their rights as Aboriginal and Torres Strait Islander people. How can you as a carer be more culturally aware? Remember that children are happy when they are strong in their culture. Be aware of your own culture, views and pre-judgements. Understand how culture influences teaching and learning. Know that learning is a two way process. Find where two cultures meet, look for commonalities. Acknowledge Aboriginal and Torres Strait Islander people as the Traditional Custodians of Australia. Seek out story books and activities that reflect Aboriginal and Torres Strait Islander cultures. Share in the stories and cultural practices that are important to the children and families you are working with. Display the Aboriginal and Torres Strait Islander flags (respect and welcoming environment) and understand what they represent. Give the child opportunities to visit and spend time in their land. Attend local Aboriginal and Torres Strait Islander cultural community events. Watch child friendly movies about Aboriginal and Torres Strait Islander culture. Encourage children to use traditional Aboriginal and Torres Strait Islander design in their works. Go on bushwalk- talk about bush, land, sea. Play and listen to Aboriginal and Torres Strait Islander music. Start or continue a Life Story Book. Find out more about respecting and valuing Aboriginal and Torres Strait Islander peoples and culture.